At Rs 27,999, Moto Z2 Play continues to support Moto Mods, attachable modules that transform smartphones into a projector, a speaker or a camera. 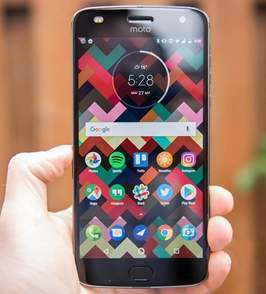 NEW DELHI: Lenovo-owned Motorola recently launched a new device, the Moto Z2 Play, as a sequel to its Moto Z Play which was well received in the Indian market. Let us see what works for this dual-SIM, 4G/VoLTE device. Encased in a metallic body, Moto Z2 Play is thinner and lighter than its predecessor. The device has its antenna redesigned which enhances connectivity. The device sports a 5.5-inch super-AMOLED screen with Corning Gorilla Glass 3 protection that displays vibrant colours and plays videos without stuttering. The screen has good viewing angles. It offers "Standard" and "Vivid" output modes for display. The touch-screen too responded well. The volume keys and power button are also metallic while the rounded home button also performs as fingerprint sensor, Google Assistant launcher and as a navigation button (it might take users some time to understand how to use the button). The fingerprint sensors worked fine and unlocked the device in a jiffy. The 16-pin connector at the back supports Moto Mods well. Motorola has managed to keep the hardware and software in an equilibrium. The device is powered by Snapdragon 626 SoC, clocked at 2.2GHz and has 4GB RAM and 64GB internal storage which can be extended up to 2TB. It runs on Android Nougat 7.0. Moto Z2 Play does not make you wait even for a second when you shuffle between multiple apps. If you are playing high-resolution videos or games, using social media apps for long hours or clicking pictures around, it will not make you suffer while choosing between an app from the background. What is more fascinating in the device is its split-screen function. You can pin an app in the upper-half of the screen and add another below. For example, you can watch a YouTube video in half of the screen while keep WhatsApping your friends in the other half. The complaint some users had with Moto Z Play regarding Wi-Fi connectivity has been resolved in this device. Powered by a 3,000mAh battery, the device can last for up to 30 hours and supports "TurboPower" charging technology that offers up to seven hours of back up with a 15-minute charge. The premium device offers a 12MP rear camera that has a combination of laser autofocus and dual autofocus pixel technology. The laser autofocus has an expanded range of up to five metres so a user can focus on objects three times further in a virtually dark environment. The device also has a 5MP front shooter with dual colour-corrected flash which performs well. The photos captured a fair amount of detail but like most devices, low-light images did not retain much of those details. Also, When you zoom into the subject, the photos lose detail and texture. But if you want to enhance the camera experience, you may wish to add a Mod to it. You will also notice that the phone heats up during charging and playing games. The rear camera protrudes out by few millimetres and is an eyesore on an otherwise premium design. Conclusion: Moto Z2 Play is a decent phone in the premium category and offers the best hardware and software experiences.